Why should only adults be ‘beach-cool’! Regardless of how young your munchkin is, it’s never too early to start looking trendy while being safe in the sun. Seeing that baby’s eyes are even more susceptible to harmful UV rays, it’s of utmost importance to invest in protective, sturdy shades that will keep cool and look good. Besides the basic functionality of having a pair of sunglasses, let’s admit that buying cute accessories for your child is something that all doting parents look forward to! Now, picking out the right shades for kids can be quite the task. Apart from the obvious essential functions, you will need to pick skin-friendly, sturdy frames, break and scratch-resistant sunglasses, and flexible ones that can be size-adjusted for your growing child. 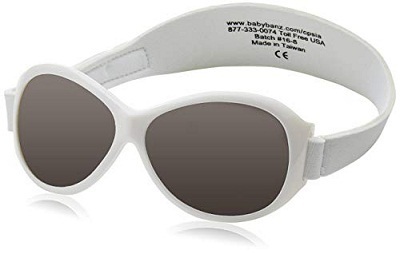 We bring you our list of the eight best baby sunglasses that will protect your baby’s eyes from harmful UV rays, but also prove to be a kid-friendly accessory that your child will love. Our very first pick comes from the much-revered brand of kids’ sunglasses creators that are typically very popular amongst parents. Available in multiple colors, one of the best features of this is the adjustable band. Banz has also added a brow-piece and rubber nose for added comfort to the little wearer. Apart from creating one of the best baby sunglasses with strap, the frame and lens have been made with polycarbonate, lending it an unbreakable quality. The band further facilitates the sunglasses to stay in place and block all the harmful rays that your child will be exposed to. The retro design ensures that your baby’s eyes are completely protected. Available for children up to 5 years of age. Silicone nose and brow to make it more comfortable. The adjustable band that will keep the product in place and last long. The oval-shaped design ensures full coverage of the eyes and eye area, even in bright sunshine. Water may discolor the paint. Frame fit may give welts if not adjusted properly. The retro design provides full coverage to the eyes, and the band helps keep it in place. You can get ready for some nice compliments what with the trendy colors and a chance to twin with your own pair of sunglasses. Our next pick for infant sunglasses is presented by Tantino. Classic aviator designed sunglasses that are not only cool to look at but easy to wear and provide the utmost protection required. These gender-neutral aviator sunglasses are made with the best-quality metal frame, with plastic lenses, and can fit children up to 18 months of age. The best part about this protective pair is that you can choose from a wide range of colors in both frames and lenses. Another great addition to these sunglasses is the cool dust cover that it comes packed in. The useful dust cover makes storage and traveling easy. These sunglasses provide cent per cent UV400 protection. Maintenance is quite easy as well. Provides 100% protection to your baby’s eyes. The best quality frame that is skin friendly. Dust cover for easy storage and travel-friendly. Tends to run small, so choose size accordingly. May seem heavy after long hours. These retro aviator sunglasses not only protect your baby’s eyes but also look trendy with all outfits. The metallic frame ensures that the sunglasses are long-lasting and stay in fashion. 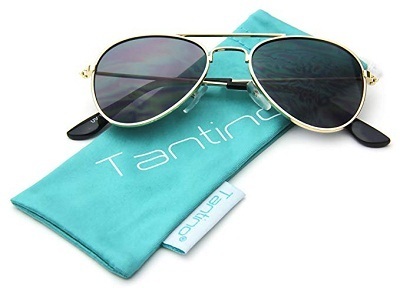 These are also perfect to twin with your own aviator pair! The next item on this list is an exclusive addition to newborn sunglasses. Babiator presents to you the trendiest of colorful sunglasses, designed in an aviator-style for kids up to 24 months of age. 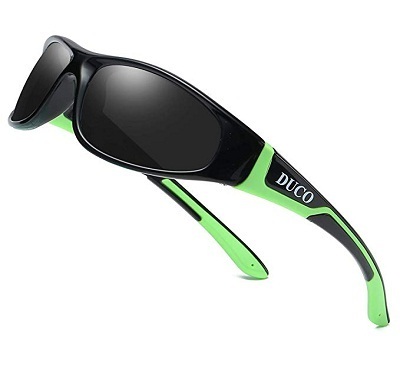 These high-quality sunglasses have flexible frames that are nonetheless durable. The lenses have been created to prevent breakage due to impact and are made with material that does not break easily. These heavy-duty sunglasses are baby skin and face shape friendly. Also, these sunglasses are free of Phthalate and BPA. Besides providing excellent coverage to the kids’ eyes, this range is available in a variety of colors, not to mention are really lightweight. Wipe the sunglasses lightly with a semi-dry cotton cloth, and then with a dry cotton cloth to keep them clean. Doesn’t chip or break easily. Aviator styled sunglasses that provide complete protection to the eyes. Tinted to protect from UV rays. Flexible frame to adjust to the face accordingly. Wrongful storage may cause screws to fall. Size-centric product. Be careful while choosing. The scratch and break resistant qualities will make you like this product right away. Adorable colors in a good fit will entice your kids to wear them for quality protection. Our next choice perfectly fits the concept of unbreakable sunglasses for toddlers. These Top Flyers are made with the revolutionary Silicone Technology and super flexible plastic, making the sunglasses next to impossible to break. Another excellent addition is the matte finish that ensures easy maintenance and fingerprints don’t show. The sunglasses are not only available in a wide range of colors, but these aviator-styled beauties come in different sizes for your growing child’s size and face shape. A dust cover made of microfiber pouch or a durable sunglasses case will ensure easy maintenance, secure storage, and safe travel. Available in both polarized and non-polarized variants. Provides 100% protection from UV rays and full coverage to the eyes. Heavy duty frames that won’t break. Precise head/ facial size required for maximum benefit. Durability backed with style is why you and your kid will love this product. The wide variety of colors and sizes coupled with break and impact-resistant frame and lenses will make this a sound choice. This next item is perhaps an excellent example of how versatile sunglasses should look. The very first quality that will attract any parent is that Rivbos creates polarized baby sunglasses. Rivbos uses high-grade silicon materials and durable, good-quality plastic to ensure that the frame and lens never break. The sunglasses are shaped such that it provides full protection to your kid’s eyes. 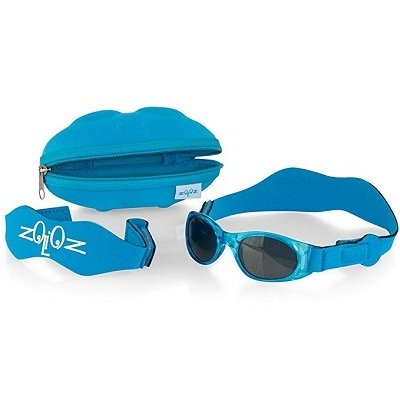 The lenses offer 100% UV rays protection, and the entire product is baby skin-friendly. The sunglasses come in more than ten shades. Another great feature is the accessories that come with the purchase; an adjustable strap, a multipurpose pouch, a cleaning cloth, and last of all, a card that tests the polarization of the sunglasses. Flexible and unbreakable frame and lens. Full coverage to the wearer. Strap provided to hold it in place. Strap tends to come off if extreme force is applied. Precise size needed for best results. The lenses may loosen with rough usage. That these glasses are affordable, soft, baby skin-friendly, lightweight, and trendy are few of the reasons that you will absolutely adore these sunglasses. Polarized lenses ensure that your kid is protected during very sunny hours. These sunglasses are from the house of Tuga who create premium-quality baby band sunglasses. Before we list the specifications of this product, let us talk about the accessories. 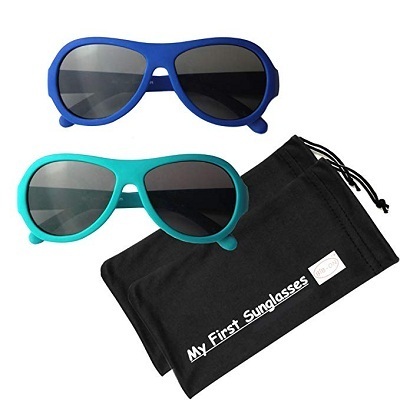 These sunglasses come in matching cases that are light and facilitate easy storage and mobility. There are two sets of soft neoprene straps that can be adjusted as per the size and age of the child. Included in the features of the sunglasses are the lenses made with polycarbonate, making them unbreakable and impact-proof. The good-quality lenses also help block the harmful UV rays. The nose frame is skin-friendly and easy to maintain. These sunglasses can be effectively used to shield against the sun’s glare as well as snow glare. Best of all, the straps ensure that the sunglasses stay in place even during heavy-duty activity. Multiple straps to fit according to the size and age of the kid. Light in weight and easy to carry. Size may be a factor is not correctly picked. Might snap if not properly packed or if exposed to a lot of weight. The adjustable straps and scratch-resistance will make this product a hit with you and your child. The cute little case makes it a fantastic choice to carry and store for days to come. Attcl has created special wayfarer toddler girl and toddler boy sunglasses designed for ages between 3 to 12 years. The body of the frame is kid skin-friendly plastic, and the lenses are composite and polarized. 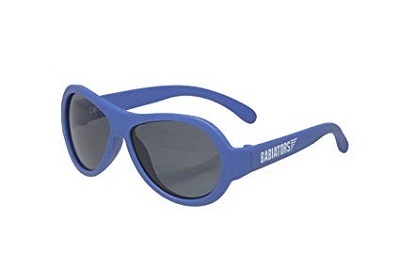 These sunglasses are available in multiple colors. These sunglasses can be used in the sun and snow alike. The product also provides 100% protection from UV rays. Furthermore, the sunglasses are comfortable to wear and are really lightweight. The product is multi-coated, Full REVO and waterproof. The frame is made of TR90, making this flexible and unbreakable. The sunglasses come packed in a nice travel-friendly case, pouch, and lens-cleaning cloth to keep the glasses clean. Adjustable strap for best fit. Can withstand all kinds of child’s play and still stay new. Polarized lens for best views. Extreme weight over the product can distort the shape. Size to be chosen wisely for the full benefit. This product stands the test of time and also your child’s pushing, pulling and rough-play. The wayfarer design provides full coverage for your kid’s eyes and the glasses stay in place during any activity. Duco presents our last choice on this list. Available in six colors, these are yet another pair of gender neutral, polarized sunglasses that can be used for a variety of activities. The purchase includes an attractive case, lens cleaning cloth, and a dust cover to make it travel and storage-friendly. The sunglasses protect from all kinds of UV rays. This unique design provides maximum coverage to the eyes of the kids. The product is lightweight and is super-comfortable on the kid’s face. Above all, the sunglasses are made of premium quality rubber that can bend, is virtually unbreakable and extremely flexible. TAC polarized lens that cannot be broken. Molds according to the size of the face, with room to adjust. Contains a mini screwdriver for fixing minor problems. You need to pick the size wisely so that it doesn’t fall off. Extreme force may pop the lens out. 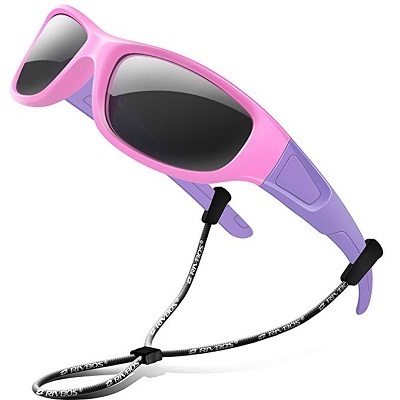 These sunglasses are incredibly versatile for all your child’s activities. The sunglasses come in an adorable case, usually car-shaped. 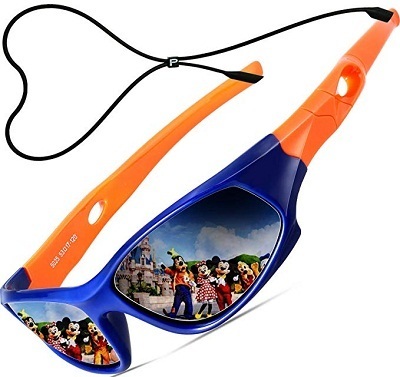 This is sure to make your child want to wear these sunglasses and play with the case. Parenting is synonymous with making the correct choice even during moments of crisis. Also, purchasing the right pair of sunglasses should depend on factors such as protection, basic functionality, affordability, and of course the place where it is going to be used. Here we have listed our top picks that should serve all occasions that ideally arise when you have an adorable child. Apart from basic functionality and stylish choices that suit your child, it is of utmost importance to ensure that you choose the size and fit wisely so that the product lasts long.